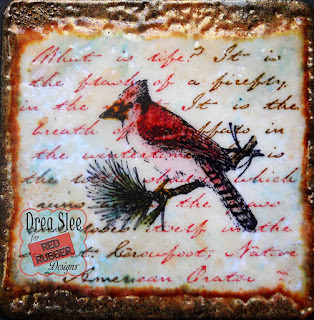 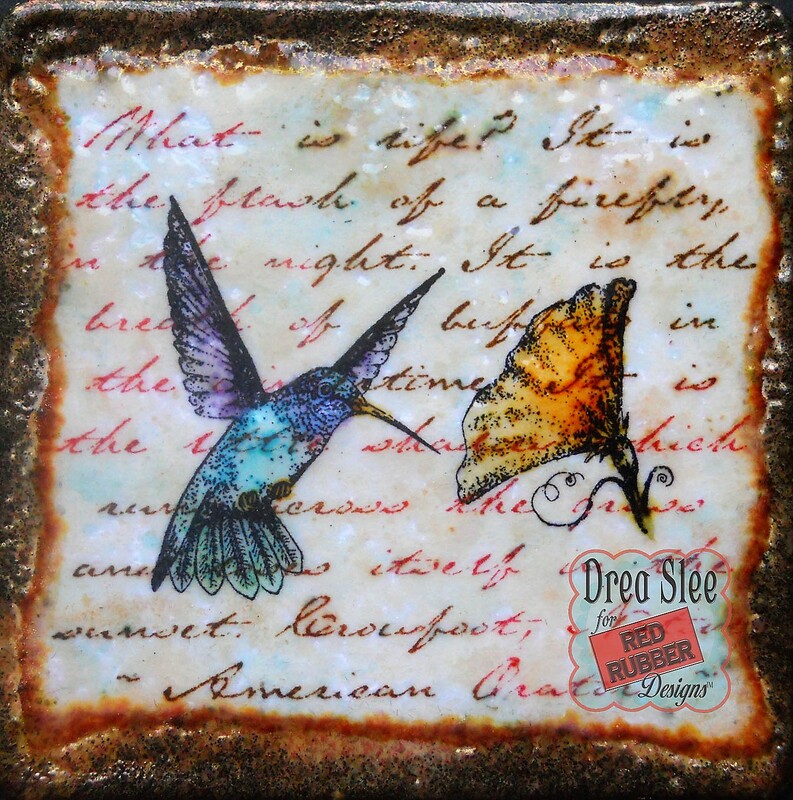 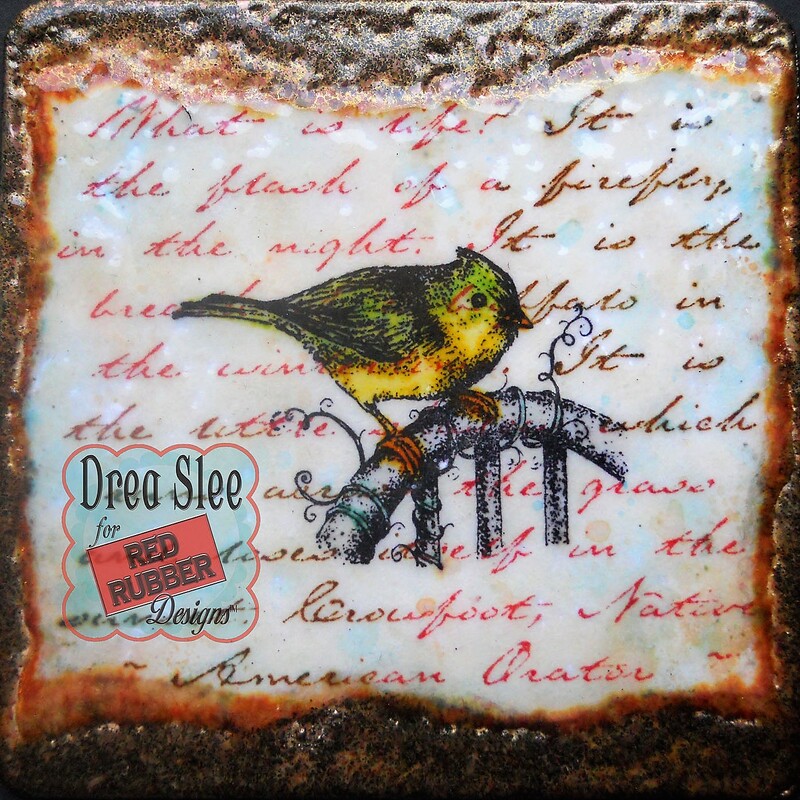 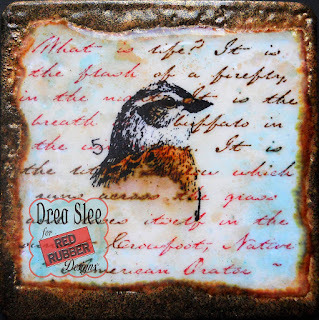 Grab a drink for these stamped coasters, featuring the Hope Perches, All Things of Nature, and Script Background Unmounted Rubber Stamps from Red Rubber Designs! Each chipboard coaster measures four inches, with a cardstock base, colored with neutral Distress Inks. 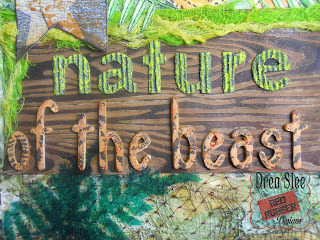 Then I tore around some white cardstock, and stamped it with the Script Background Stamp, using permanent brown and red inks. The birds were stamped in the center, using permanent black ink, with the Hope Perches and All Things of Nature Stamps. 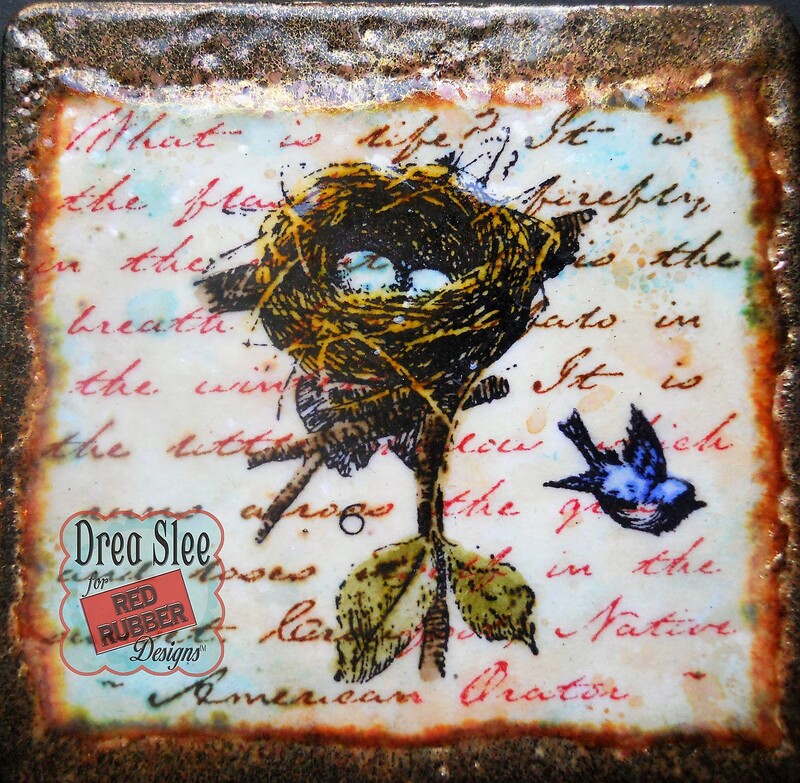 Then I smooshed the background with Broken China and Tea Dye Distress Inks, using a water brush pen, to color the images with various Distress Inks. 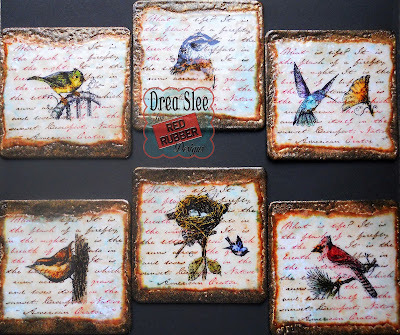 Once I got the images glued to the coasters, I coated them four to five times with Emerald Creek Vanilla Sugar Baked Texture, giving them lots of shine, and a wonderful smell. 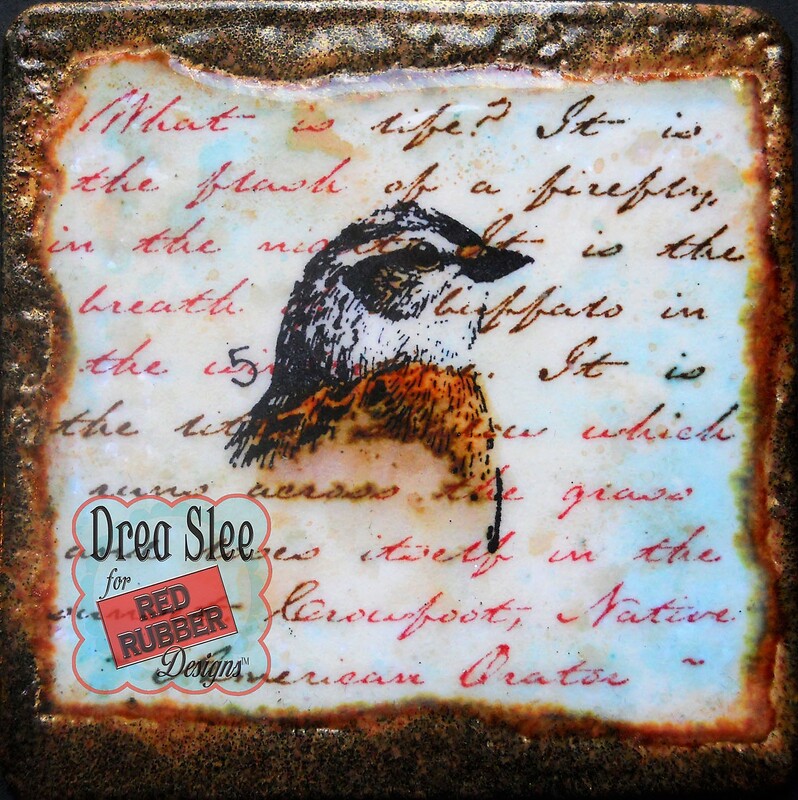 Then I applied a coat of EC Ancient Amber Baked Texture to the edges, followed with a coat of Burnt Copper Leaves Embossing Powder. 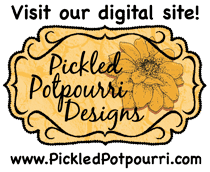 I just LOVE the effects! 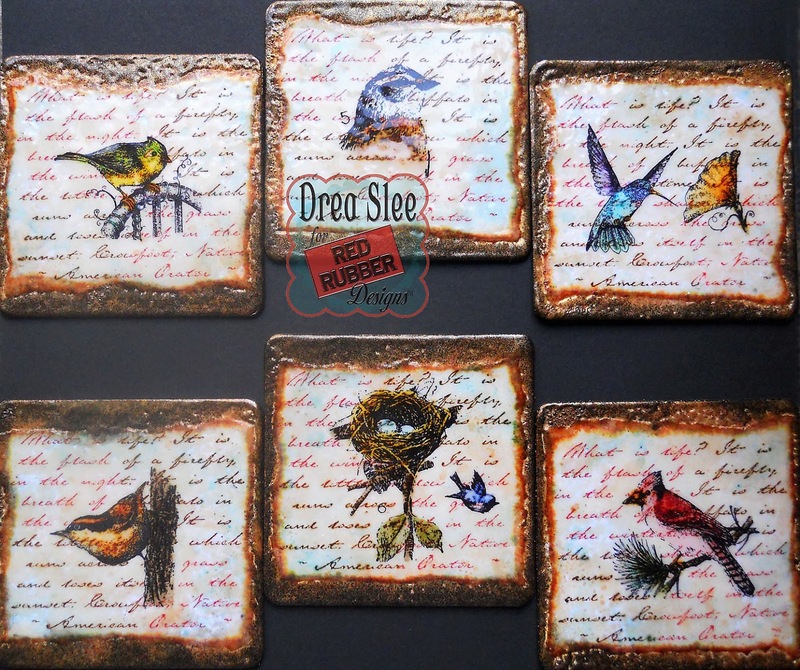 This set includes six coasters, and would make a great gift for any bird or nature lover, with stamps from Red Rubber Designs! 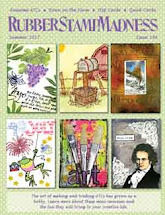 Hello and welcome back Stampers! It felt so good to finally create this jungle scene in my art journal, as the idea started a few months ago, as I was going through my Red Rubber Designs Stamps! 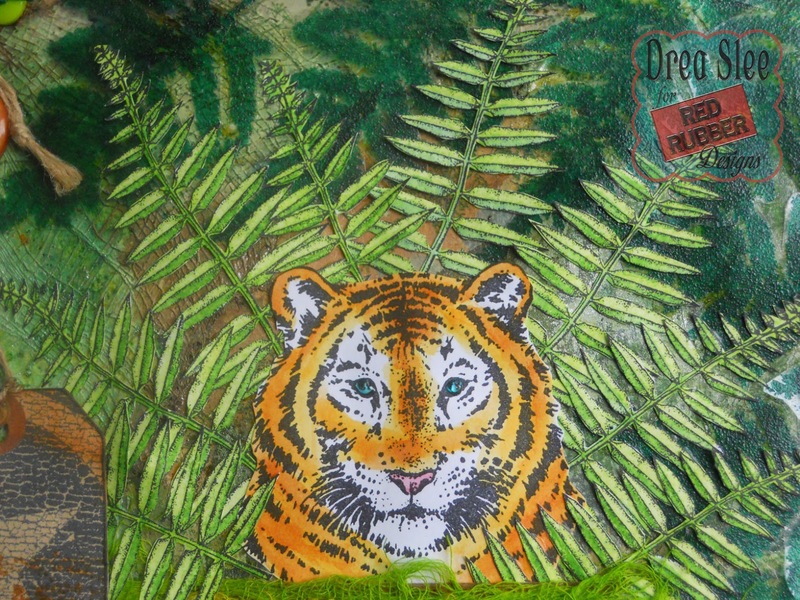 I took out Tiger Face, Take Pride, Fern Sprig, and Fern Frond, setting them aside, until I was able to come up with this page, made with some recycled bits and pieces. Like this Converse shoe tag, that I cut along the star, inking and spraying it. I also recycled the brown netting from some fruit, shown below with stamped elephants from the Take Pride Stamp. 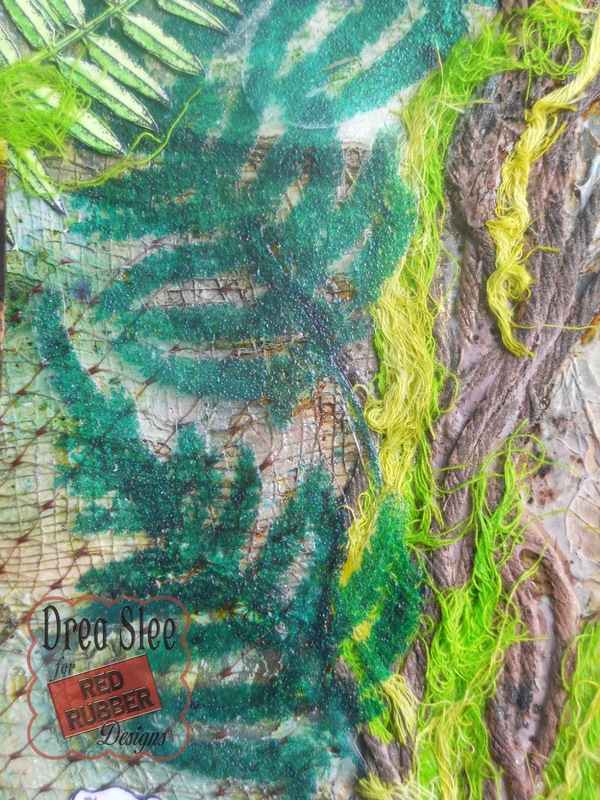 Cheesecloth on the background gives lots of texture, as well as making great moss, dyed with Magicals and sprays. 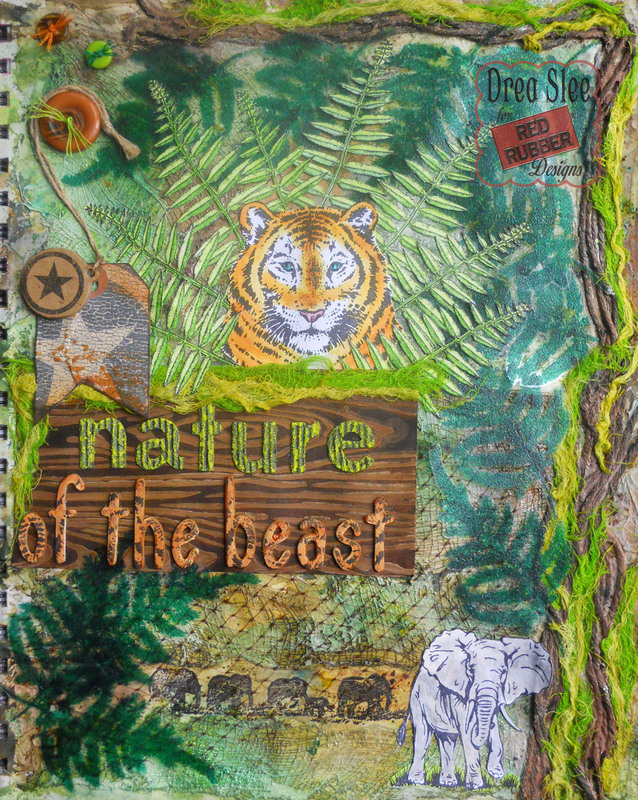 I also used twine along the top and right, covering it with gesso, and painting with sprays. The leaves coming from it were embossed onto clear transparency paper with the Fern Sprig Cling Mounted Stamp, using Ranger's Topiary EP. 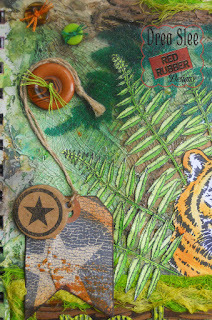 The wood was made with Ranger's Woodgrain Stencil, some white gesso, and sprays. 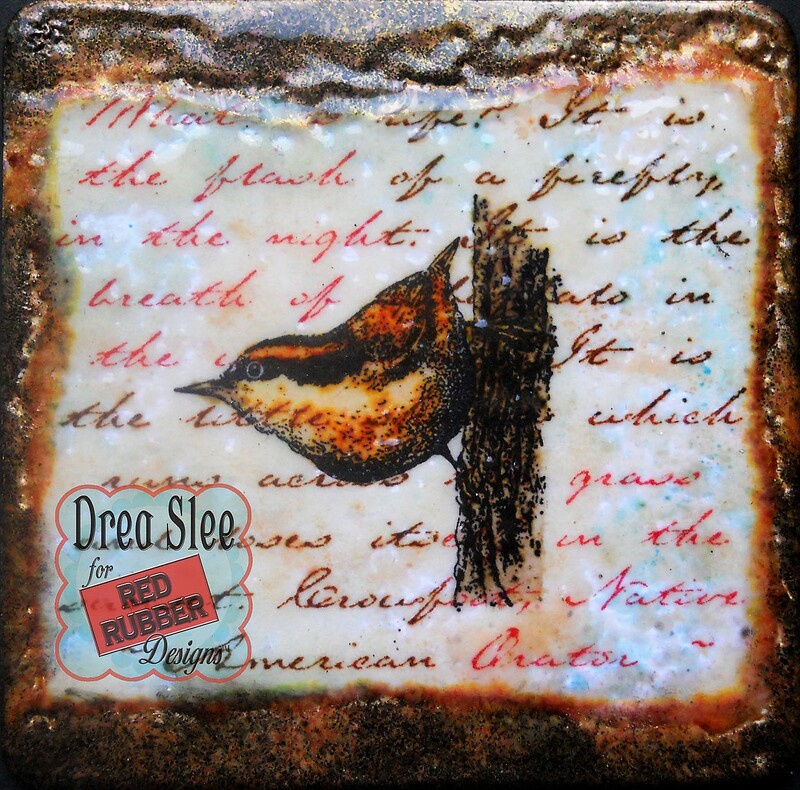 Then I embossed the Thickers that spell NATURE with Distress EP Shabby Shutters. 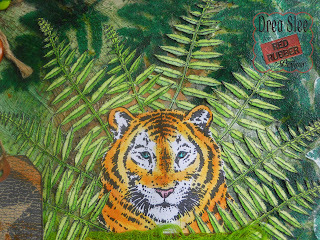 Since my Thickers were black, it didn't come out as bright as I wanted, so I went over it with some paint. 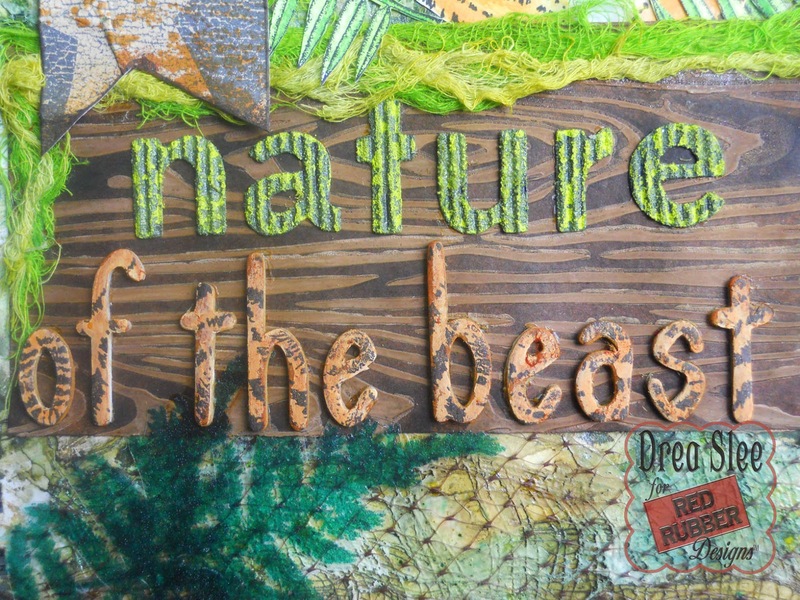 The rest of my title was made from chipboard, covered with gesso, colored with sprays, and stamped with the Tiger Face Cling Mounted Stamp. 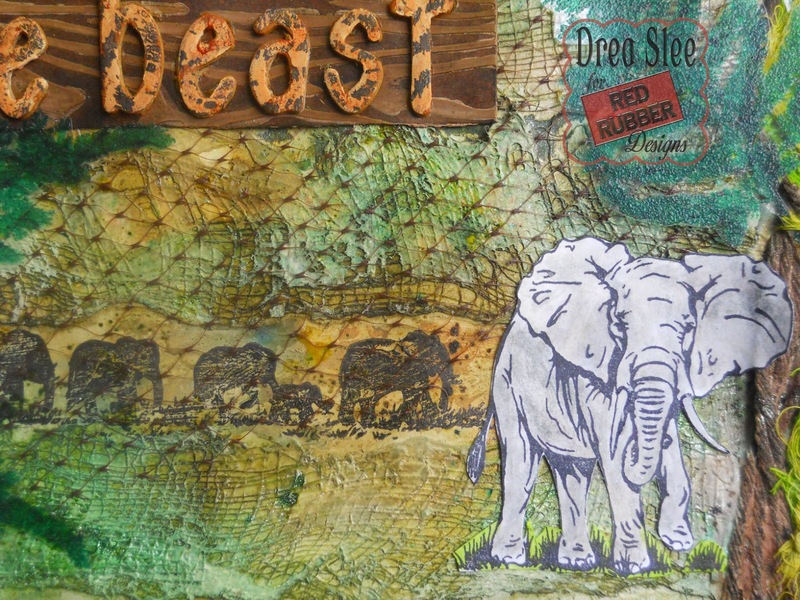 Thanks for looking, and get your Animal Cling Mounted Rubber Stamps at Red Rubber Designs!